Exploiting the many resources of our solar system may enable humanity to venture beyond its confines for the first time, and blaze a trail to other stars. Building a spaceship that can travel to other star systems on human timescales — over the course of mere decades — will be a challenging and expensive proposition, with costs likely running into the hundreds of billions of dollars. But the economic and technological hurdles won't be so steep if our species has begun tapping the vast riches locked up in asteroids and other bodies beyond Earth orbit, advocates say. Interstellar flight is so daunting because of the vast distances separating stars. The extrasolar system closest to us, for example, is the three-star Alpha Centauri, which lies about 4.3 light-years away, or more than 25 trillion miles (40 trillion kilometers). The farthest-flung spacecraft ever launched from Earth is NASA's Voyager 1 probe, which has covered about 11.3 billion miles (18.2 billion km) since blasting off in 1977. But it would take Voyager 1 roughly 70,000 more years to reach Alpha Centauri, and its newly discovered Earth-size planet, if the probe were headed toward that particular system (which it isn't). So traditional chemical-propulsion technology, such as that used by Voyager 1 and other spacecraft plying the solar system today, is just not going to cut it for interstellar flight. "We need to start looking at alternatives if we're ever going to bring into reality some of the stuff that we've been dreaming about and that makes up a staple of science fiction — how to explore these new worlds beyond the solar system," Obousy told SPACE.com. This illustration depicts Deep Space Industries' Harvestor class spacecraft for asteroid mining. Possible alternatives include harnessing the power of nuclear fusion or matter-antimatter reactions. Or a probe could cruise through space like a boat through the ocean, propelled by super-focused light beamed from the environs of Earth onto a gigantic sail. 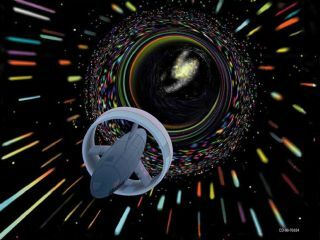 Researchers had thought that such a warp drive would require a power source with the minimum mass-energy of the planet Jupiter. But recent calculations by Harold "Sonny" White, of NASA's Johnson Space Center in Houston, suggest that some design tweaks could bring that figure down to the mass-energy of a spacecraft like Voyager 1, which weighed 1,800 pounds (815 kilograms) at launch. "I might have moved this idea from impractical to plausible," White, who is also an Icarus Interstellar team member, told SPACE.com. He and his colleagues are now building a small tabletop experiment as a first-step "existence proof" of the idea. None of these advanced propulsion technologies are close to flight ready, so any effort to build an interstellar spacecraft will require a lot of research and development work. The costs will thus be quite high. While stressing the difficulty of estimating potential price tags at this early stage, Obousy ventured that an unmanned interstellar probe might cost several times more than the $100 billion International Space Station. And a crewed vehicle could top $1 trillion. Those numbers might be off-putting to many governments, especially in these tough fiscal times. But tapping the riches of the solar system could help change things, Obousy said. Asteroid mining is a good example. Scientists have estimated that a single near-Earth asteroid, the 1.5-mile-wide (2.5 km) Amun 3554, contains $20 trillion worth of platinum and other metals. Such figures have enticed two separate companies, Planetary Resources and Deep Space Industries, Inc., to get into the asteroid-mining business within the last nine months. Both firms plan to extract from asteroids not only metals but also water, which can be split into its constituent hydrogen and oxygen — the chief components of rocket fuel. This illustration depicts Deep Space Industries' Fuel Processor class spacecraft for asteroid mining. If all goes according to plan, the companies' work could lead to the establishment of an in-space manufacturing industry that builds habitats, satellites and other spacecraft away from our planet. Asteroid mining could also help set up off-Earth "gas stations" that allow traditionally fueled craft to top up their tanks cheaply and efficiently. These developments would help humanity extend its reach throughout the solar system, a necessary step along the path to interstellar flight, experts say. "I think before we ever really undertake sending something to another star, we will probably have to be masters of our own solar system," Les Johnson, deputy manager of the Advanced Concepts Office at NASA's Marshall Space Flight Center in Huntsville, Ala. (and also an accomplished science-fiction writer), told SPACE.com. Obousy voiced similar sentiments, pointing out the economic importance of such a big footprint. "If we can become a civilization that has vast resources at its disposal — orders of magnitude more than we have today, as a product of space exploration, space mining and the solar-system-wide economy — then we may reach a stage where an interstellar mission doesn't actually cost us that much in the bigger scheme of the gross domestic product of the solar system," he said. Icarus Interstellar aims to help humanity achieve interstellar flight by the year 2100. Obousy said he believes that this can indeed happen, despite the economic and technological hurdles that must be overcome. One reason for optimism is the ongoing exoplanet revolution, which has shown that our Milky Way galaxy is teeming with planets. Researchers have confirmed more than 800 worlds beyond our solar system, and scientists estimate that billions more are out there. Astronomers have confirmed a planet in the Alpha Centauri system and detected five potential worlds circling the star Tau Ceti, just 11.9 light-years away. That includes two that might be in the star's habitable zone, the range of distances from a star in which liquid water could exist on the world's surface. The discovery of the first true "alien Earth," a planet the size of our own in its star's habitable zone, could help build a groundswell of public support for interstellar spaceflight, Obousy said. Our species might want to examine such a world up close for any signs of life. The detection of electronic signals from an intelligent alien civilization could have a similar galvanizing effect. Overall, Obousy thinks humanity has a good shot of launching its first interstellar mission by the end of the century. As an example of our species' potential, he points to how quickly air travel became routine after the Wright brothers' ramshackle first flight in 1903. "I think a lot of people tend to overestimate what we can accomplish in the short term, in the next five to 10 years," he said. "But they also vastly underestimate what we can accomplish in the long term, decades or a century from now."